I wasn't the greatest fan of Grameme Simsion's first novel, The Rosie Project. It took too long to get going and - particularly in the early sections - bore the scars of its original iteration as a script, but not in a good way. However, it did get better and I did enjoy it so I was very pleased to be granted a review copy of its sequel. I was even more pleased once I'd read it. The Rosie Effect picks up the story some months after end of the previous book - while it's probably better to read that one first so you know the characters, this is perfectly understandable if you don't. Don and Rosie are now married and living in America where Don works at Columbia and Rosie is attempting to balance finishing her PhD with her medical studies. Oh, and becoming a mother. Which was slightly less planned than Don is easily able to cope with. 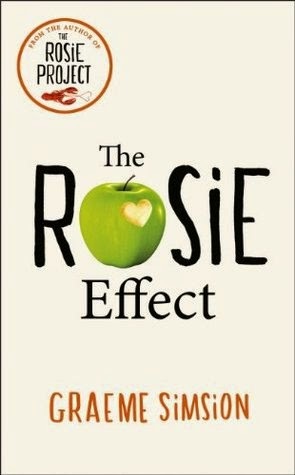 Although The Rosie Effect is a comedy, and a chucklesome one, I found much of it absolutely heart-wrenching. Initially it trades on the well-worn path of the first book, Don's (probable) Aspergers providing the comedy and the tension and while unfortunately veering extremely close to uncomfortable territory in the early sections. Don is given an unnecessarily Pooterish aspect which sits staggeringly poorly against the rest of the book, especially when both books attitude to Don's (possible) Aspergers is taken into account. He has not been given that diagnosis and this has always read like a deliberate (and positive) choice by the author. Things settle down though, Don becoming his character rather than an emotional-slapstick caricature. His introspection and lack of empathy suit the first person narration perfectly. Even when you can see the set pieces coming they're massively enjoyable, forwarding the plot in ways which manage to be both ludicrous and worrying realistic. So, why the "heart-wrenching" then? Because underneath everything else, The Rosie Effect does what David Nicholls' Us was trying to do but better. Don may be very different from your usual character but his is the universal experience. He is going to be a parent and he is scared. His efforts to cope with the situation and to do the best and right things are normal, and it's Simsion's plotting skill which takes them and pushes them further without become stupid. Yes, you can see where Don is going to go wrong as soon as he has certain ideas, but you can't always see where he's going to go right. He doesn't know what he's doing but he's trying; he wants to do well and it tugs on my heart. The Rosie Effect is a great book. It's an unshowy, solid read with wide commercial appeal but non of the dumbing down that phrase usually indicates. It's left me wanting to go back and re-read the first, and I'm feeling pretty sure it'll be one of those books I enjoy more the second time around. For this one though: 4 stars.